OpenSFS was at Supercomputing 2013 November 17-20 in Denver Colorado. This was the 25th annual Supercomputing conference and exhibition, and the OpenSFS organization was on the exhibition floor in booth 4125. Among the activities at the booth were a drawing for Kindle Fire, which drew over 200 entries, and the OpenSFS Passport, a treasure hunt that rewarded visits to all the OpenSFS partners in return for possibly winning an iPad mini. The Passport program had 37 participants. But the high point was definitely the booth party, which gave a good number of folks the chance to meet and talk to some the Lustre developers and OpenSFS board members. 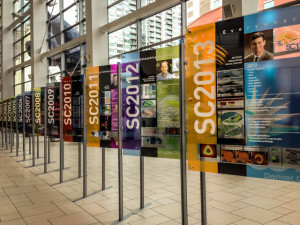 Details are at the SC13 events page.